On image Desztics Jeno. 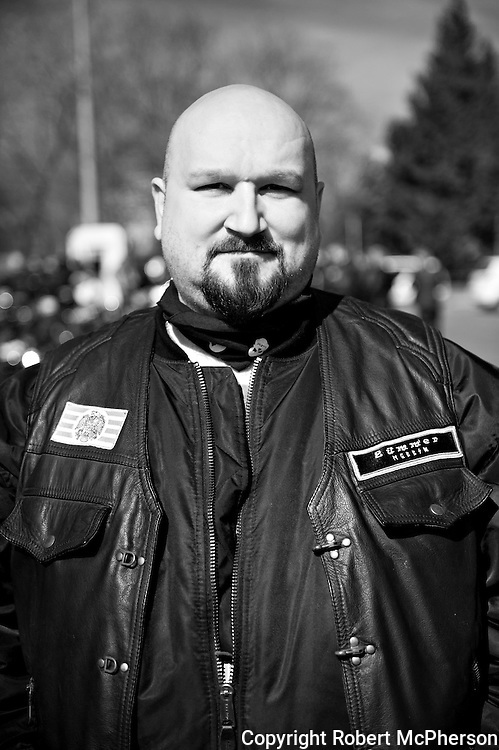 Member of the right-wing extremist group Gòj Motorosok in Hungary. They are a smaller organization than "The Hungarian Guard" and operate with low profile. However, they have taken over the leadership in one of the theatres in Budapest. They are not associated with any government party in Hungary. On one of the national days in Hungary in March 2012, they had their own "parade" riding their motorbikes around in the city of Budapest. They claimed themselves that they did not do this to get public attention. The photographer got the oppurtunity to meet them over a very short period of time privat.